1. To make fresh sour-apple juice, juice 5-6 tart apples (like Granny Smith) with the skins intact. 2. Combine all ingredients together in a 2-quart pitcher. Stir and chill for at least 1 hour. 3. 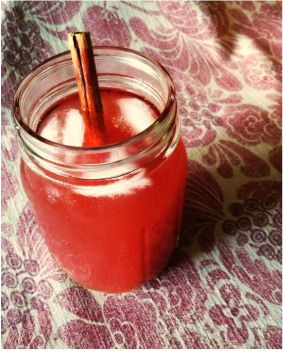 When ready to serve, pour mixture over ice in a Mason jar, garnish with a slice of tart apple or a cinnamon stick. -If you don’t have a juicer, you can use a high-powered blender instead. “Liquefy” with ½ cup water per apple. -If you can't find spiced apple cider, you can steep mulling spice teabags in warmed cider. -Cranberries are a potent source of anthocyanins - the same phytochemical that gives wine grapes their added health benefit. The cranberry juice should be tart and 100% cranberries, no apple or grape juice blends.